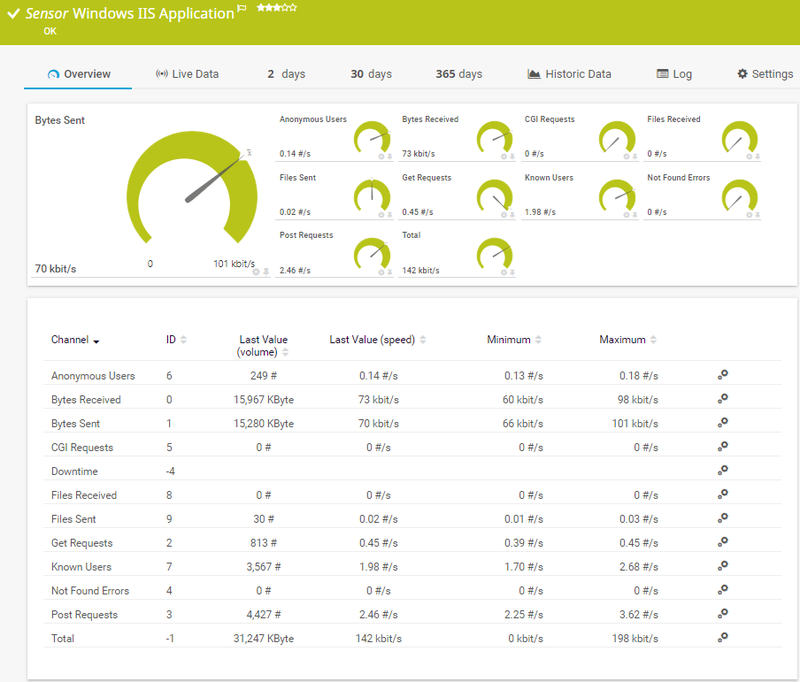 The Windows IIS Application sensor monitors a Microsoft Internet Information Services server using Windows Performance Counters or Windows Management Instrumentation (WMI), as configured in the "Windows Compatibility Options" of the parent device. It can also monitor applications that use IIS, such as Microsoft SharePoint or Microsoft Reporting Services (SSRS). Requires Windows 2008 or later on the probe system. Uses a hybrid approach to query monitoring data: Performance counters as standard approach and WMI as fallback. Select the web service instances you want to monitor. PRTG creates one sensor for each instance you choose in the Add Sensor dialog. The settings you choose in this dialog are valid for all of the sensors that are created. You see a list with the names of all items which are available to monitor. Select the desired items by adding check marks in front of the respective lines. PRTG creates one sensor for each selection. You can also select and deselect all items by using the check box in the table head.